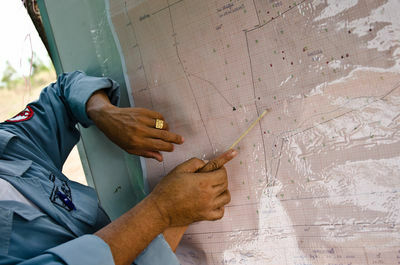 Recent estimates show that there may be as many as four to six million mines and unexploded devices left undetected in Cambodia, although some estimates run as high as 10 million. The magnitude of land mines littered across provinces throughout Cambodia has become a severe problem for the country’s residents. 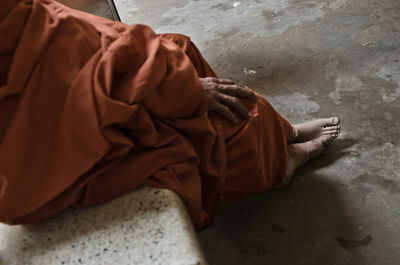 This is the legacy of three decades of savage war that raged in Cambodia. All sides used land mines, manufactured in China, Russia, Vietnam and the United States. Pol Pot, whose regime was responsible for the deaths of approximately 1.7 million Cambodians between 1975 and 1979, purportedly called land mines his “perfect soldiers.” Cambodian Mine Action Centre (CMAC) systematically de-mine the country's provinces striving to eradicate the ever present threat of UXO's, land mines and cluster munitions but they are up against a huge challenge. 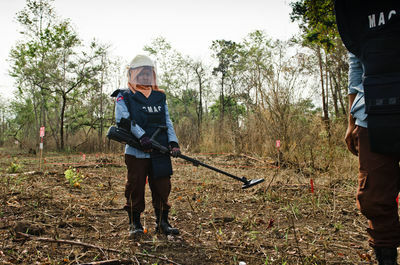 A female CMAC mine clearer covers her head with a towel to soak up the sweat caused by the the intense Cambodian heat. Pol Pot, whose regime was responsible for the deaths of approximately 1.7 million Cambodians between 1975 and 1979, reportedly called land mines his perfect soldiers. 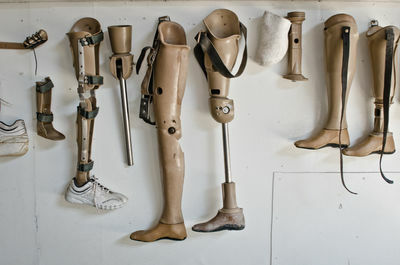 Prosthetic limbs on display in a physical rehabilitation centre in Siem Reap. A CMAC de-mining unit 2 operative. Former Khmer rebel soldier Mr Brak Socheat, 51, stepped on a land mine in the Prasat Vieng Village, Siem Reap province, whilst fighting Cambodian government forces. He was returning home to his family in the Srey Snom province in 1995, after the fighting had ceased, and lost his right leg after standing on what he believed to be a Chinese-made device. Left with a wife, two sons, and a daughter to support he struggles to provide his family with the basic food and clothing. 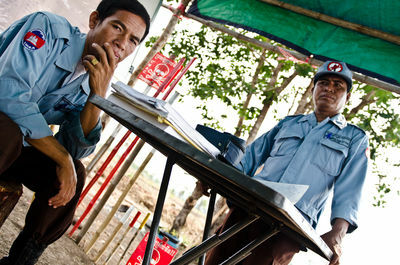 The Cambodian government contributes only 3% to CMAC's ongoing nationwide operations. A severe problem that Cambodia faces is the sheer quantity of land mines littered across provinces throughout the country. 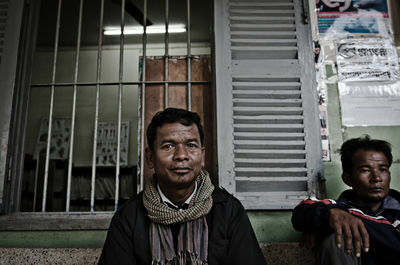 This is the legacy of three decades of the savage war that raged in Cambodia. All sides used land mines, manufactured in China, Russia, Vietnam and the United States. Another day on the long road to rehabilitation is complete. 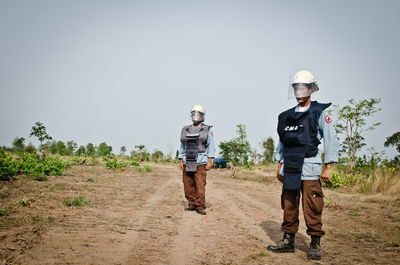 The Cambodian Mine Action Centre (CMAC) estimates that there may be as many as four to six million mines and unexploded devices in Cambodia. CMAC operations managers look over the minefield currently being cleared of anti personnel mines, cluster munitions and other UXOs. 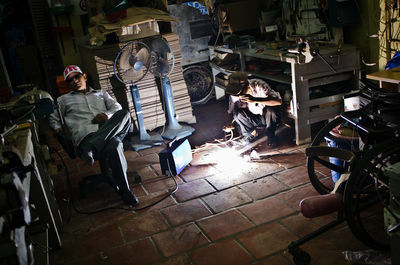 Prosthetic technicians at work welding new prosthetic limbs. 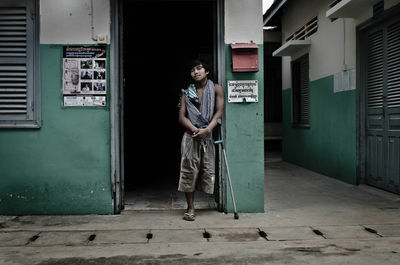 A land mine survivor shows his stump during a rehabilitation session in a farming community in the Battambang province. 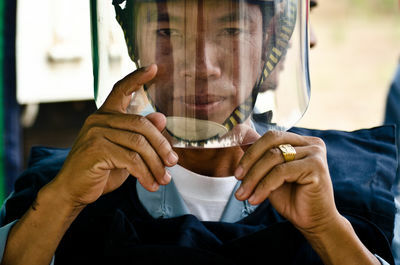 At the current rate of progress, it may take as long as 100 years to clear all the mines in Cambodia. The UN estimates that with current technology, it will take nearly 1,100 years to clear all the mines in the world. 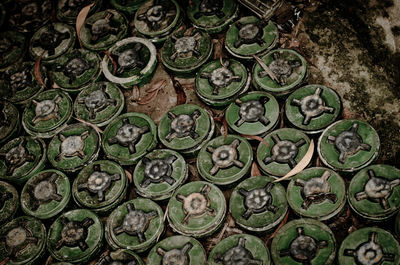 The number of land mine-related casualties in Cambodia has decreased in the last ten years, but still remains one of the highest in the world. 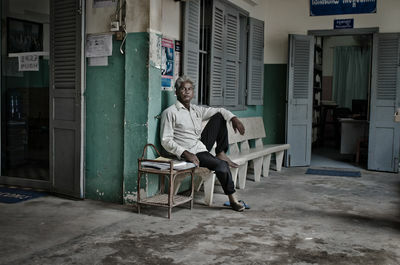 Mr Liay Doung, 61, is a former Cambodian government soldier who lost his leg whilst on a special mission protecting a high ranking South Vietnamese captain from Khmer Rouge forces. He stepped on a land mine laid by the Khmer Rouge forces near Phnom Kulen mountain, Siem Reap province, resulting in the loss of his left leg and heavy shrapnel injuries. He has to support his wife, two sons, and two daughters while working as a farmer. According to UNICEF over 40,000 members of Cambodias population, including many children, have lost limbs due to land mine explosions. 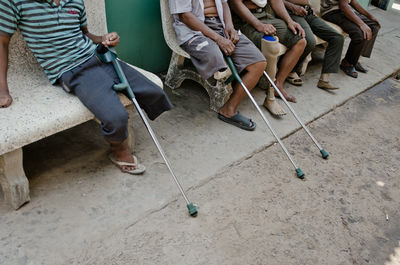 Land mine victims take a rest after their morning rehabilitation session. 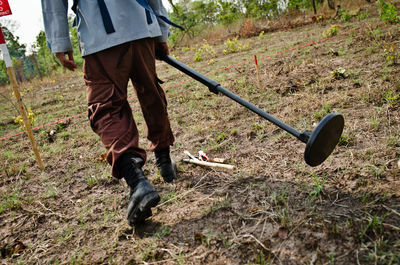 According to the Land mine Monitor in 2013, Cambodia still contains over 700 square miles of UXO-contaminated land. Thats an area roughly the size of the entire city of London. 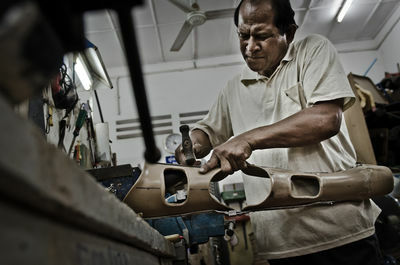 A prosthetics technician works putting the finishing touches on a patients new leg. A young girl sits and watches as her father, a former Khmer Rouge soldier, receives rehabilitation for his new prosthetic leg. He triggered a land mine whilst patrolling the border separating Thailand and Vietnam in 1989, which he believes was laid by the Viet Cong forces recent. With a family of six to provide for, he struggles to maintain a normal life working as a farmer in Kompong Thom. ICRC statistics claim that only 25% of mine victims arrive at hospital within 6 hours of being injured with 15% having to travel for more than 3 days before they reach a hospital. For a family with a very low income, no access to proper healthcare, and no governmental aid, to have a member lose a limb can be disastrous. 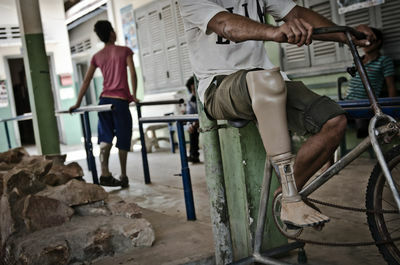 A land mine survivor takes a rest after his morning rehabilitation session. CMAC staff plan their days work on the minefield. Mr Liay Doung, 61, is a former Cambodian government soldier who lost his leg whilst on a special mission protecting a high ranking South Vietnamese captain from Khmer Rouge forces. He stepped on a land mine laid by the Khmer Rouge forces near Phnom Kulen mountain, Siem Reap province, resulting in the loss of his left leg and heavy shrapnel injuries. He has to support his wife, two sons, and two daughters while working as a farmer. The Cambodian government in power at present compensate him with small sporadic payments of ten to fifteen dollars at random times throughout the year.